Spain is a strong country for Metal. Since the times that BARON ROJO used to unleash its heavy and furious sound in those lands, many Metal maniacs appeared, and now, we can hear a lot of bands from the country. 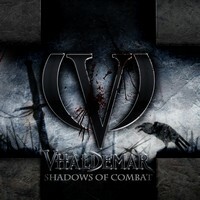 So to hear a band as VHÄLDEMAR is not a surprise, and this reissue for their fourth album, “Shadows of Combat”, is a very good piece of Metal. We can say that they play the well-known Power Metal from our days, with a great influence from the German School. Of course you can hear some traditional Heavy Metal influence on their work as well (especially from IRON MAIDEN on their guitars), and some catchy choruses are presented in their songs. But their main difference is the heavier insight that guides their work, and it’s truly full of energy and life, although their method is not something totally new at all. Pedro J. Monge, the band’s guitarist, is the album’s producer, and made the engineering, mixing and mastering of it as well. His work on these matters made “Shadows of Combat” sounds clean, aggressive and heavy at the same time, what means that we can access every part of their songs, and understand them fully without great efforts. Although they aren’t causing a new sound revolution in Power Metal, they play in a way that allows their 12 songs to be a very good experience for our ears. The brutal and melodic energy of “Rock City” (very good parts of bass guitar and drums, along some influences from Hard Rock, can be heard), the heavy and thunderous “Black Thunder” (very good work on guitars, indeed) and “Danger Street” (this one bears a clear German Metal influence, namely ACCEPT), the traditional Power Metal song that “Shadows of Combat” is, the Hard Rock influence that can be felt on “The Old Man” and “Metal & Roll” (this one with charming vocals) are very good songs that can hook us on the place where we are. This new release of “Shadows of Combat” has a bonus track on “King of the Night”, a song that is fine, showing a clear influence from Power Metal from the 80’s in its melodies. I must state that some reissues are not worthy of our attention, but VHÄLDEMAR deserves it, and our applause as well.